LOS ANGELES (February 8, 2018) – SAG Awards® Executive Producer Kathy Connell today announced the 25th Annual Screen Actors Guild Awards®ceremony will be held on Sunday, January 27, 2019. The Silver Anniversary celebration of the previous year’s outstanding film and television performances will be simulcast live on TNT and TBS at 8 p.m. (ET)/5 p.m. (PT).  The Inaugural Screen Actors Guild Awards® debuted on February 25, 1995, airing live from Stage 12 at Universal Studios. Angela Lansbury opened the ceremony, ending with the first “I Am an Actor™” declaration, which would become the ceremony’s signature opening. The first-ever Actor® statuette was presented to Martin Landau for his supporting role in the film “Ed Wood,” with first-in-their-category Actors® taken home by Jason Alexander, Kathy Baker, Jodie Foster, Dennis Franz, Tom Hanks (who proudly held up his SAG card while accepting), Helen Hunt, Raul Julia (presented posthumously), Dianne Wiest, Joanne Woodward and the “NYPD Blue” and “Seinfeld” ensembles. Ann-Margret presented the first televised Life Achievement Award to George Burns, the 31st recipient of the union's highest honor. The Screen Actors Guild Award for the outstanding performance by a motion picture cast debuted on the 2nd SAG Awards, when the actors from “Apollo 13” were honored.